Nepenthes khasiana has been described as one of the most cold tolerant Nepenthes around and has been available for sometime now. I had a large hanging N. khasiana for years until it finally died. It was the only large Nepenthes like that that I've lost. I'm not sure why it died. I was looking for a replacement and for some reason there weren't any available. Then a few cuttings appeared that originated from a clone at Cal State Fullerton. This plant is male and the pitcher coloration can get redder than pictured above. It seemed that the only N. khasianas in cultivation for some time were female. Photos of other N. khasianas in their native habitats showed pitchers with reddish blotching on them. A lot of color compared to the typical green pitcher clones available. 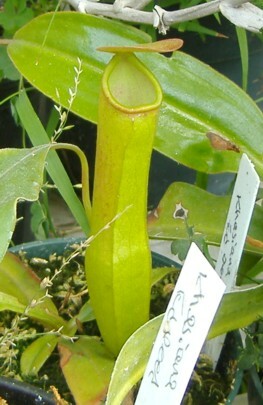 Borneo Exotics has N. khasiana available in various sizes so photos of larger plants should start appearing in the Nepenthes forums. They have 4 clones in cultivation and state that their plants grow well in lowland and highland conditions. My old clone regularly put out masses of basal and sideshoots making cuttings widely available. I'll see how this plant compares to my old plant in growth habits.